The Worktopia Project, funded in part by the Government of Canada and under the leadership of The Sinneave Family Foundation and Autism Speaks Canada, brought together 11 leading disability service agencies from across the country to deliver employment readiness programs for individuals with autism. Worktopia programs were designed to build skills to improve the odds of employment success. From 2015 to 2019, Worktopia served 961 participants and engaged 328 employers across Canada. Of 279 participants surveyed one year after program completion, 32% were employed and 8% had returned to school. Leaders from participating agencies came together in Toronto in October 2018, to consider how they could extend their work together at the community and system level to change the odds of employment success. 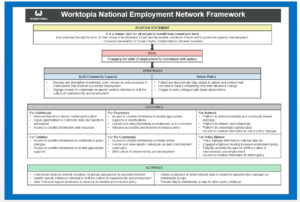 The Worktopia National Employment Network was the result. 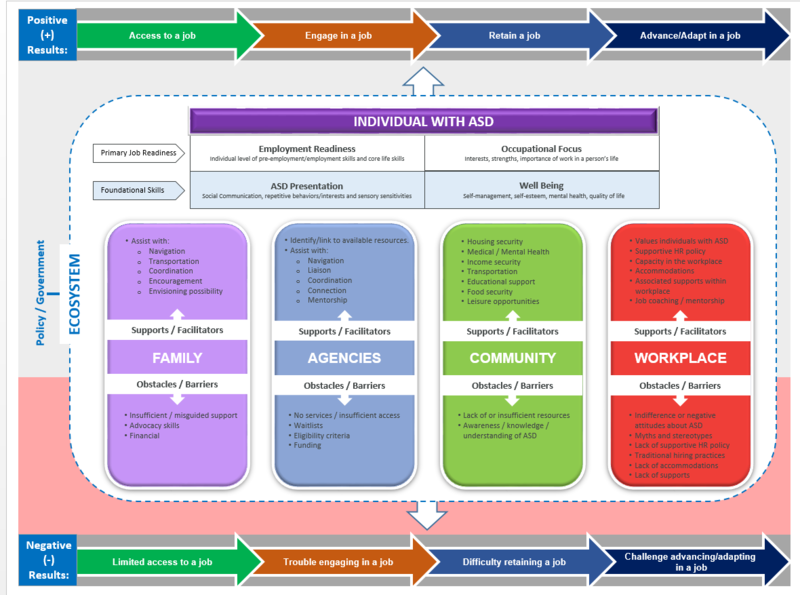 We’ve learned that getting and keeping a job for someone with autism involves many components within one’s social world. It will be important to consider not only the individual with autism but the surrounding “ecosystem”. A shared understanding of what this ecosystem is made up of will support our collective efforts to drive change in our communities. to change the odds of employment success for people with autism. and are willing to share their time, knowledge and talent. professionals, researchers, policy makers and any other interested stakeholders. The Sinneave Family Foundation and Autism Speaks Canada act as conveners for Worktopia and are committed to supporting the success of the network. Two key strategic priorities for the network will be to build community capacity and inform policy. Work of this magnitude requires the efforts and perspectives of many. A framework has been developed to support Worktopia and is available in both English and French for download. If you are interested in participating or learning more, please call 1-888-733-7976 or e-mail us.